Customize your note cards to fit your purpose by choosing your options. "I use my note cards as a quick and easy way to provide people and organizations a glimpse into what my songwriting and poetry is about. It conveys meaning, and emotion as well as the practical info on how to find me on the web." Print personalized note cards for thank you cards, invitations, introduction or correspondence. They are perfect for customized recipe cards or index cards too. Looking for more uses? Custom note cards are ideal for personal or business stationery when paired with our custom envelopes. Use our note card layout templates to ensure that your artwork prints correctly. Find the layout template format below that best fits your printing project. Then follow the specifications provided to ensure your artwork prints correctly. Print note cards for a variety of personalized uses. 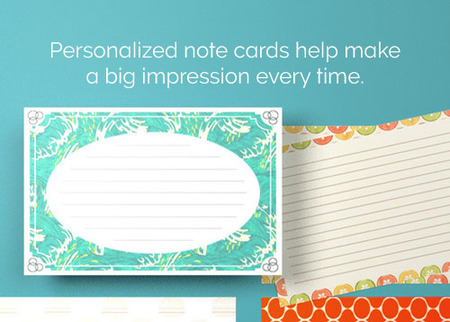 You can design your note cards to be colorful and cute, or bold and professional. Monogrammed designs look absolutely stunning on note cards. In any case, they make a statement and get noticed over boring white cards. Custom note cards can be used for corporate or business inter-office communication, or for teachers to send home with students’ assignments. As a great gift for bridal showers or graduations, they can include recipes or advice from guests. You could even try a trendy design on the back like a chevron or striped pattern. Outside of business, note cards can also be used as recipe cards, index cards, or thank you notes to show that you genuinely care about people.